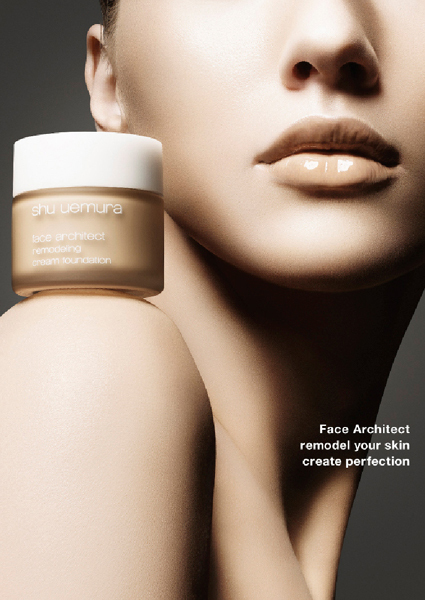 All Posts Tagged With: "Cream Foundation"
As part of the growing FACE ARCHITECT franchise, shu uemura introduces the latest in foundation – face architect remodeling cream foundation, a new creamy formula that is ideal for adding subtle highlights and accents to the face. Face Architect, Mr. Uemura’s philosophy towards face makeup, used the face as a canvas to apply makeup that will enhance natural beauty. From studying the bone structure and variations of skin thickness, to observing the individual differences in women, this detailed observation is known as “structuralizing” the face. By observing, it will become clear which parts of the face need more or less foundation to sculpt and refine natural beauty. KEY BENEFITS: Remodeling Effect: Flex-fit formula allows foundation to sit naturally as a second layer of skin, which allows for buildable coverage. Cover-fit particles provide for precise and transparent coverage. Ultimate Comfort: The skincare-like formula contains nearly 20% depsea water and volatile oil, which allows foundation to spread comfortably on skin. Anti-Aging Treatment: UVA/UVB SPF protection and Jasmine extract is added for an anti-oxidant benefit. Semi-Matte Finish: Semi-matte texture with natural sheen creates a sophisticated, chic look. Available in 10 shades. SRP: $45.00.